Our families, who supported us and took time to come to visit us and wished a wonderful and safe trip. Special thanks to Françoise and Jean-François, Pierre-Olivier’s parents, who took care of all the family during the first week, we would not be sailing today without their help! Our friends, who made the effort to spend time with us, gave a second life to some of our stuff and they made us feel like “explorers” anytime we shared our dream with them, it is very inspiring to see how contagious is our explorer mood! Kids’ school teachers, who provided us with enough information/material to start homeschooling; it makes our teacher lives much more easier! Russo Yachting team at La Seyne-sur-Mer, who during the last 2 months has been professionally helping us to set up the boat, stripping and painting the hull, making the new main sail, taking care of the anchor’s chain… and they always managed to find a convenient solution for us. During our first week, the boat went back in the water and we have been busy cleaning, tidying and setting up everything above and below deck. We kicked off the second week by installing the sails. We were all very excited to set up our brand new main sail in Vectron. We also started homeschooling the kids: everyday we spent 2 hours doing “school”. So far so good, 2 hours seems enough for the kids and for us. 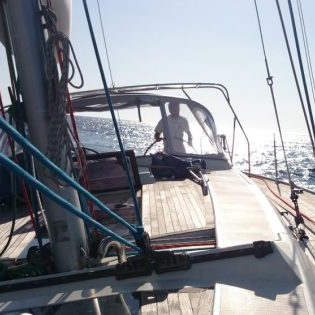 As soon as the boat was ready to sail, we left the dock and started sailing, our goal was to stay around for a couple of days, just in case we had any issue with the sail. The weather was windy and wet at the beginning so we spent a family day without getting out of the boat. Hopefully the weather changed and we were able to move to Porquerolles and Hyères. Porquerolles island is beautiful and kids are excited to help us for the sailing. We are happy to see them taking their life jacket on their own as soon as we lift the anchor. We set up our self-organised dashboard and are now adapting to our new life style. We also had the opportunity to meet other families and visit some friends. The week ended with a couple of minors incidents. Yesterday, friends invited us for dinner at their place in Hyères, we left our dinghy (the small boat that we use to move from the boat to the beach or dock when we are anchored) on the beach and when we came back the dinghy was not there. It drifted from the beach. There is a small tide in the Mediterranean, but it proved to be enough… We have to thanks our friends for the great time that we had at the dinner and specially for helping us to look for the dinghy and taking us to the boat. We are lucky that it happened when we were with friends and they were able to take us to the boat. I cannot imagine the mess it would have been abroad, where no one we knew could have taken us back to the boat. Unfortunately, the dinghy and its engine is still missing and we need to buy other one. Today we noticed that the front-most locker was wet, after investigation we discovered that we were getting water seepage from the pullpit. It’s been a pain for Pierre-Olivier to fix it, because part of the forward cabin had to be broken to access the nut right below the deck. The good thing is that today we had a calm and sunny day, it would have been more challenging to fix it at the beginning of last week. As you can see, we are having great times all together. We managed to get everything ready and to enjoy sailing in family!